Starting a trial can be done by creating an account at office.instoredoes.com/settings#signup. We give you a 7-day free trial to make sure Instore is a good fit for your business. Feel free to reach out to us at 855-568-3696, x1 as you explore Instore. After your Instore account is created, you can create your menu, add employees, and synchronize all data with your iPad. 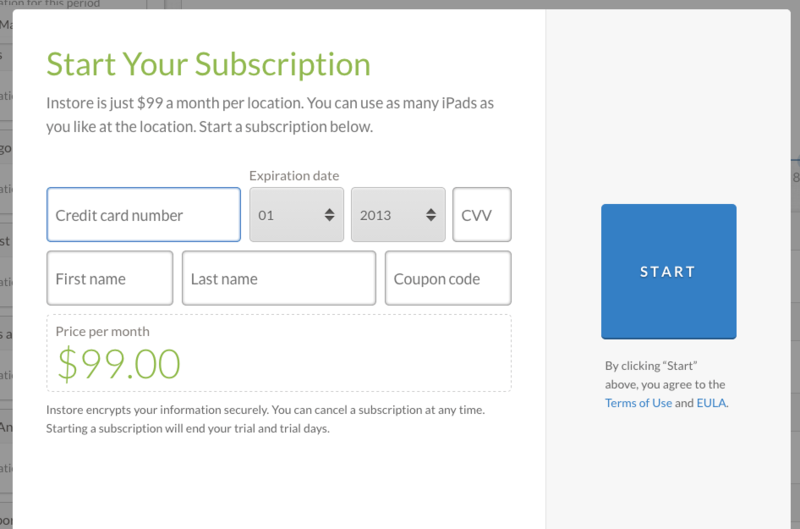 To use Instore beyond the 7-day free trial, you’ll need to start a subscription. Login to your account and navigate to the Settings are of Office. Click Billing, which loads a screen to input your credit card information. Fill out the required information and press the blue START button. Instore will charge your credit card at the beginning of each month of service.